In a survey of rankings from a variety of sources, Pleated Jeans maps the United States of Shame. Because all states must be bad at something. Go, California. If we’re the worst at air pollution, does that mean we actually have really clean air? Must be. 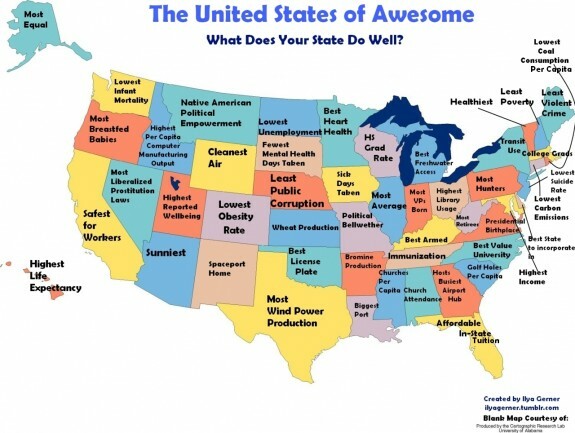 See also a spinoff from Political Language: The United States of Awesome. Because all states must be good at something. Go, California. Lest you get too depressed by the first infographic here, the second one shows what your state is best at. Competition is a tried and true motivator, so let’s hope we can look forward to some changes in the rankings next year….